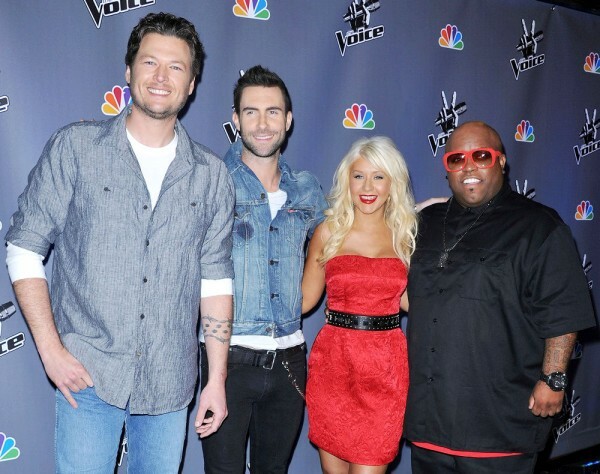 XOXO Jes - Canadian Entertainment News: What Coach would you choose on The Voice? What Coach would you choose on The Voice? The Voice premiered tonight....my verdict? I love it! Well, ok maybe I am getting a bit carried away. I like it because it is new. The idea is a mixture of American Idol and Dragon's Den. The contestants sing...the coaches decided of they like them or not...if they do, then the sweet talking starts and the coaches try to get the contestants to come on their team. The choice ultimately belongs to the contestant...kind of like DD. So great. Blake Shelton: Something tells me that he is all about the country...so if I didn't want to leave the show sounding like a slightly more polished version of Miley Cyrus I would probably not go that route. CeeLo Green: CeeLo is pretty dope - but I can't take people seriously who wear sunglasses indoors. Also, I wouldn't want CeeLo trying to give me fashion tips...there can only be one peacock in the room and that is defs not my style. Christina Aguilera: Love Christina...but I don't really like what she has done with her voice in the later years and I would hate for her to try to project something like that on me. I would also be very distracted by the fact that she looks like an albino Snooki. Adam Levine: Adam would be my ideal, but I would be afraid that I would spend the whole time trying to figure out how to get into his pants and less time perfecting my vocal chops. Once the teams have been chosen the real smack down begins...but I am thoroughly enjoying this part of the show.